In amongst all of the dark reds and berry tones for the Autumn season, sometimes throwing a bright neon orange into the mix to shake things up a bit. What better way to do that than break out my Nails Inc Portobello nail polish. 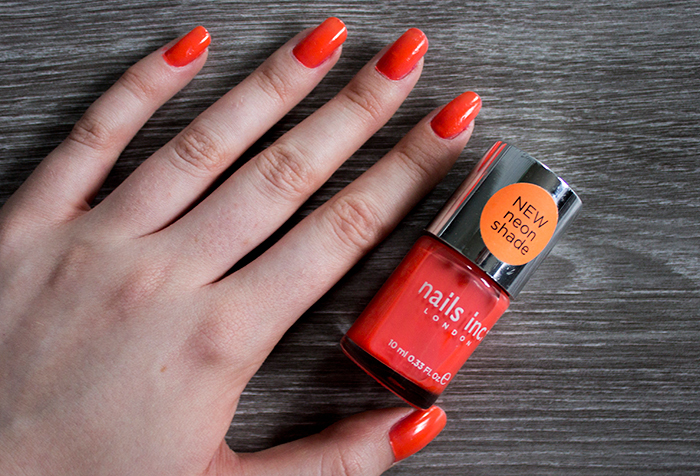 Portobello is a bright, neon orange with a semi-matte finish. The colour is really attention grabbing and I feel like it's a shade that suits every skintone. Due to the finish, the formula is very thin so it's best to apply a white basecoat before applying it. In the photo above I had three coats of the polish alone without any basecoat and you can see it's still not quite enough. As for longevity, I found it lasted really well on the nails with around 5+ days of wear without any sign of chipping. Pretty impressive for a polish with a matte finish if you ask me! It may require a little more work than the regular polishes but trust me, the result is worth it.